Created by David Simon (HBO's The Wire, Generation Kill and The Corner) and Eric Overmyer (St. Elsewhere, Homicide: Life on the Street and HBO's The Wire"), the Emmy®-nominated drama series TREME kicks off its 11-episode second season SUNDAY, APRIL 24 (10:00-11:00 p.m. ET/PT), exclusively on HBO. While the spirit is alive in New Orleans, its residents are still dealing with loss – of homes, jobs and loved ones. In the wake of her brother's death, Ladonna (Khandi Alexander) helps her mother move out of her old home and upriver to Baton Rouge, while worrying about the increasingly dangerous conditions in the neighborhood. Toni Bernette (Melissa Leo, recent Oscar®-winner for The Fighter) helps her daughter, Sofia (India Ennenga), cope with Creighton's death, while still assisting others in finding answers for their own losses. And Albert Lambreaux (Clarke Peters) is forced out of his temporary residence and must make ends meet with a meager insurance check. In addition, New Orleans civil servants now have to contend with the shocking rise of crime, coupled with the mysterious loss of funds essential to the restoration of the city. Lieutenant Terry Colson (David Morse) is caught in the crossfire, dealing with the current crime wave and still trying to sort out the truth in the wreckage of the past. TREME's musicians are trying to survive as well, with mixed results. Antoine Batiste (Wendell Pierce) maintains the lifestyle of a musician, despite persistent challenges from his girlfriend Desiree and a lack of funds, and entertains the idea of leading his own band. Yet as the New Orleans school system comes back to life, he also finds himself drawn to the very place where the city's musical culture begins. Meanwhile, Annie Tee's (Lucia Micarelli) profile is on the rise, while she continues her relationship with DJ Davis McAlary (Steve Zahn), who now has fresh musical ambitions of his own. On the other hand, Annie's ex-boyfriend Sonny (Michiel Huisman) – though presented with a genuine opportunity – must first contend with his own demons. Meanwhile, renowned trumpeter Delmond Lambreaux (Rob Brown) has been joined in New York by chef Janette Desautel (Kim Dickens), both pursuing their careers there, but feeling the tug of their native culture. "We are following the actual timeline of post-Katrina New Orleans as a means of understanding what happened – and what didn't happen – when an American city suffered a near-death experience, says David Simon. In doing so, we're trying to address ourselves to what the American experiment has become and what possibilities remain for us. "We are an urban people now. How we live together – and of what we are capable or incapable of achieving as an urban people is going to define our future, he adds. New Orleans and its recent history speaks to that." David Morse (The Hurt Locker; HBO's John Adams) and India Ennenga, both featured in the first season of TREME, become series regulars, along with new cast member Jon Seda (the upcoming Larry Crowne; HBO's The Pacific), playing Nelson Hildago, who arrives fresh from Dallas to avail himself of the unique opportunities that New Orleans could offer some in the wake of Katrina. The returning ensemble cast of TREME includes: Wendell Pierce (HBO's The Wire, the HBO documentary "When the Levees Broke: A Requiem in Four Acts"); Khandi Alexander ("CSI: Miami," HBO's Emmy®-winning The Corner); Clarke Peters (Damages, HBO's The Wire and The Corner); Rob Brown (Stop-Loss, Finding Forrester); Steve Zahn (A Perfect Getaway, Sunshine Cleaning); Kim Dickens (HBO's Deadwood); Melissa Leo (Oscar® winner for The Fighter; Oscar® nominee for Frozen River); Lucia Micarelli; and Michiel Huisman (The Young Victoria). 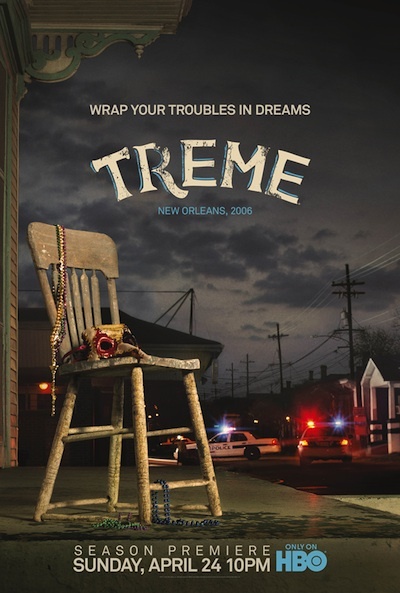 National and Louisiana-based musical performers featured in the second season of TREME include Dr. John, Juvenile, John Hiatt, Lucia Micarelli, Steve Earle, Shawn Colvin, the subdudes, the Radiators, Henry Butler, Wanda Rouzan, Cyril Neville, Christian Scott, Donald Harrison Jr., Ron Carter, Kermit Ruffins, Rebirth Brass Band, Galactic, Dirty Dozen Brass Band, Hot 8 Brass Band, Leroy Jones, John Boutte, Paul Sanchez, Glen David Andrews, Susan Cowsill, Walter Wolfman Washington, Steve Riley, Katey Red, Big Freedia, Sissy Nobby, Ingrid Lucia, Mem Shannon, Al Carnival Time Johnson, Tom McDermott, George Porter, Evan Christopher and members of the Pineleaf Boys and Redstick Ramblers, among many others. In addition to Simon and Overmyer, Nina K. Noble also serves as an executive producer. Anthony Hemingway is the supervising producer. In addition to Simon and Overmyer, the writing staff includes consulting producer George Pelecanos and executive producer (episodes 11-13) James Yoshimura, as well as New Orleans-based writers Tom Piazza, Lolis Eric Elie and Mari Kornhauser. Noted food writer and author Anthony Bourdain (Kitchen Confidential) also joins the writing staff this season. Antoine contemplates a move, while LaDonna resists one; Davis moves in new directions, personally and professionally; Toni worries about Sofia's emotional distance; Colson contends with the return of crime to New Orleans; Annie returns from a national tour. In New York, Delmond debuts his new album, while Janette holds her tongue in the kitchen of a demanding boss. Juvenile sits in with Galactic and the Dirty Dozen Brass Band. Episode #14: "Santa Claus, Do You Ever Get the Blues?"